The weather here in Texas has started to turn to fall. 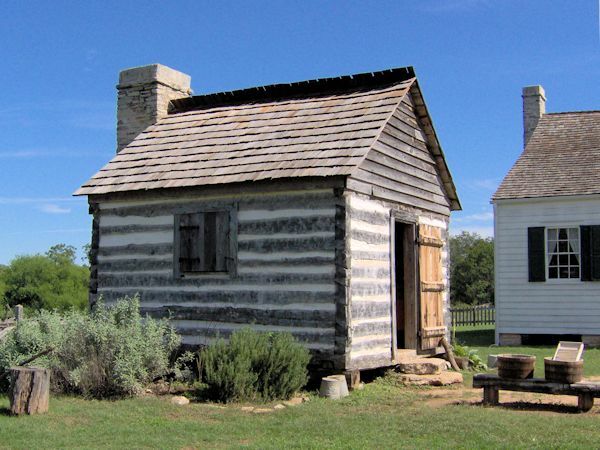 What better time to pack up our little travel trailer and take a few days to visit some of the nearby historical places. So after a couple of days postponement to avoid some serious flooding in the central part of the state we headed out on Thursday, October 17th. The weather was perfect. First stop was Washington On The Brazos. 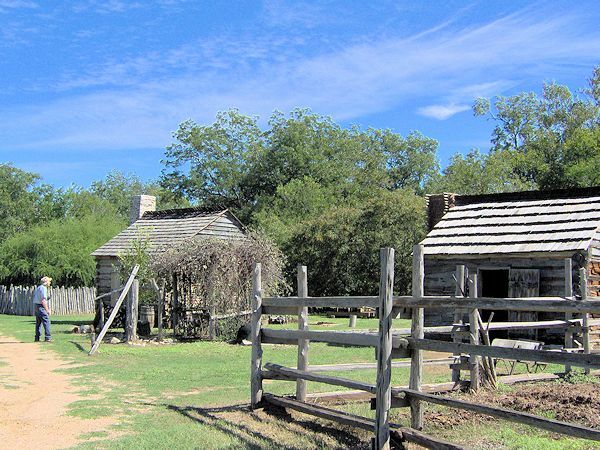 It's combination history museum, 19th century farm and the town where the Texas Declaration of Independence was written, all located in a state park. 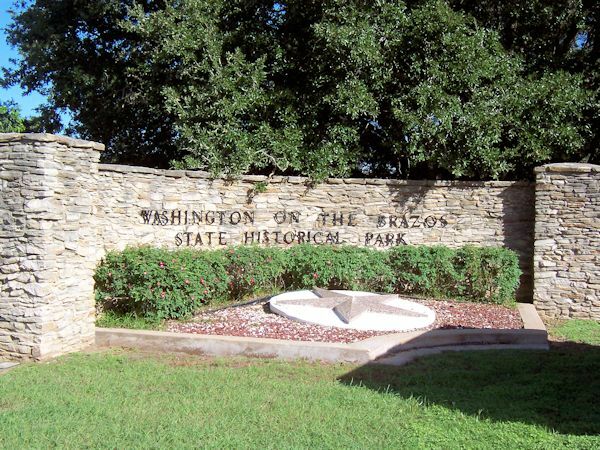 The town of Washington on the Brazos, the "on the Brazos" part to differentiate it from the bigger city out east, is considered the birth place of Texas. After stopping at the visitor's center to get a map and guide pamphlet (and pay the entrance fee) we headed on foot to explore the old town. This building is a replica of the one where the writers of the declaration of independence met. The original building has long since disintegrated. 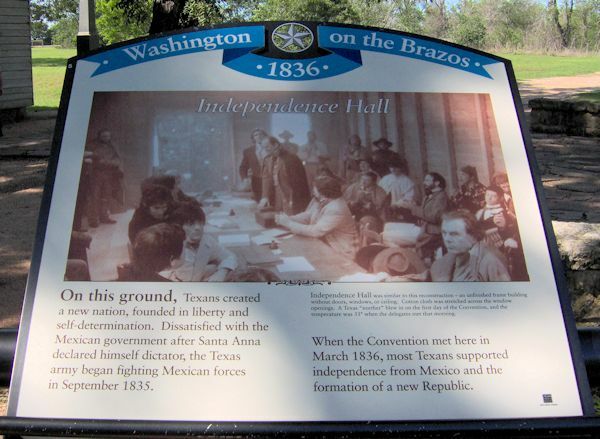 This plaque explains the reasons for the convention and, as the dates imply, while the framers of the declaration met here the war for independence was already underway in other parts of the state. The meeting place was, well, crude. Only cotton drapes covered the windows and there was no stove for heat. Maybe that's why they waited until March when temperatures become a bit more tolerable. From Independence Hall we walked toward the rest of the town. 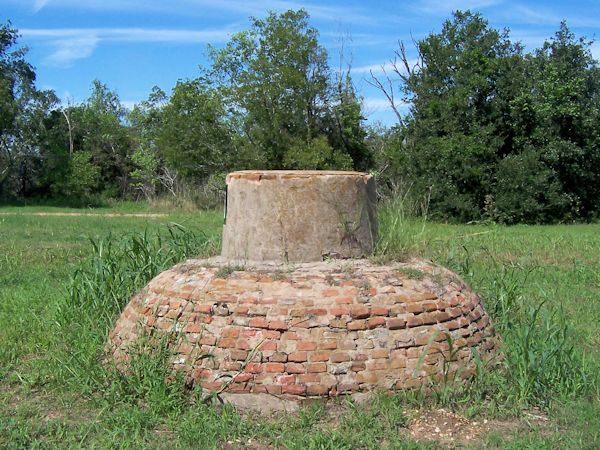 The only thing left standing from 1836 is this cistern. Although there were a few dozen houses and stores nothing remains. 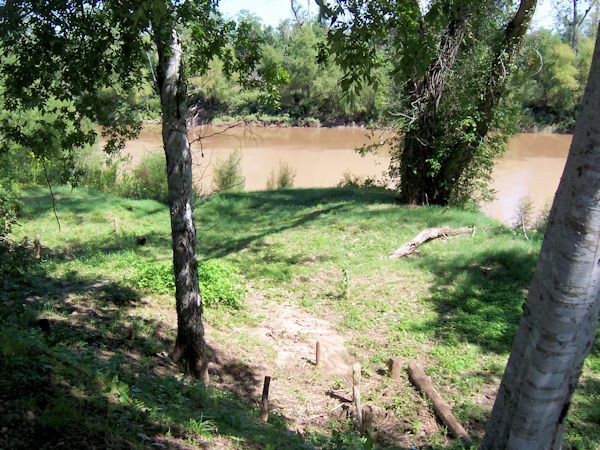 One of the reasons for Washington's existence was the Robinson Ferry which crossed the Brazos at this point. Not much remains except what might be some old pilings. The river height when we were there was just a little above normal, having dropped considerably from the floods a week earlier. From the town site we drove to a picnic area for lunch and then on to Barrington farm. 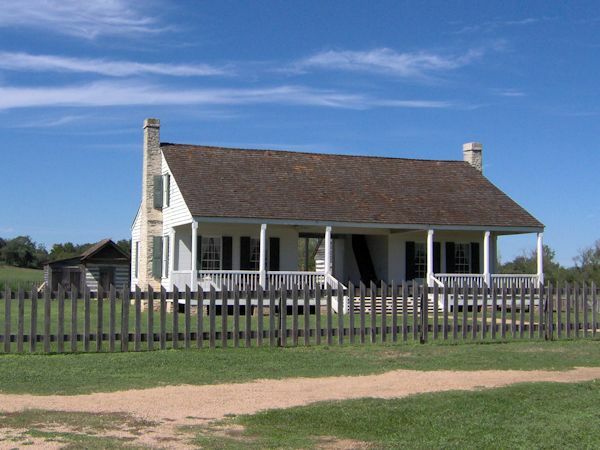 The farm was owned by Anson Jones, the last President of the Republic of Texas. Jones moved to the farm, named after his his native town in Massachusetts, in 1844. He and his family lived here and operated the farm until 1857. Touring the farm is on foot. (We got a lot of walking in during our weekend.) This is the barn, used mainly to store tools, machinery and some animal feed. The animals were kept outside year-round. 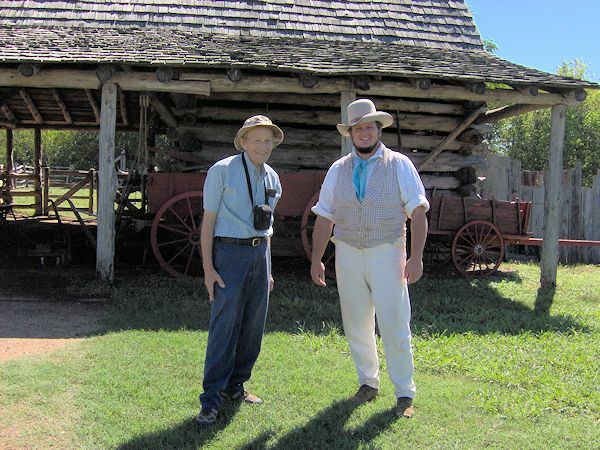 The whole farm is staffed with interpreters dressed for the period including Farmer John on the right. But that guy on the left doesn't look like much of a farmer. Behind the barn were two oxen in a pen. The present day staff does use them for some farm work. 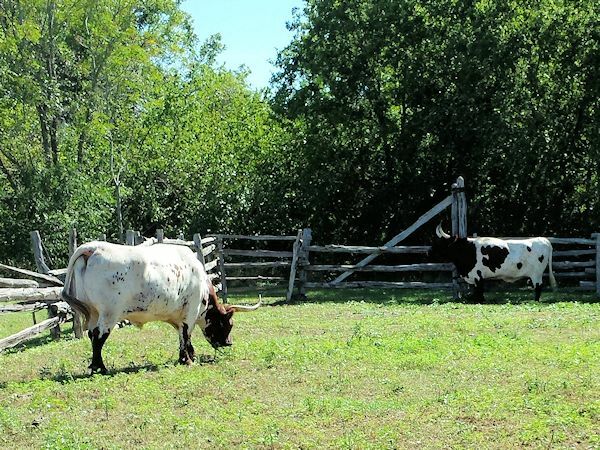 When the Jones family owned the farm oxen were used for all the heavy pulling farm work. 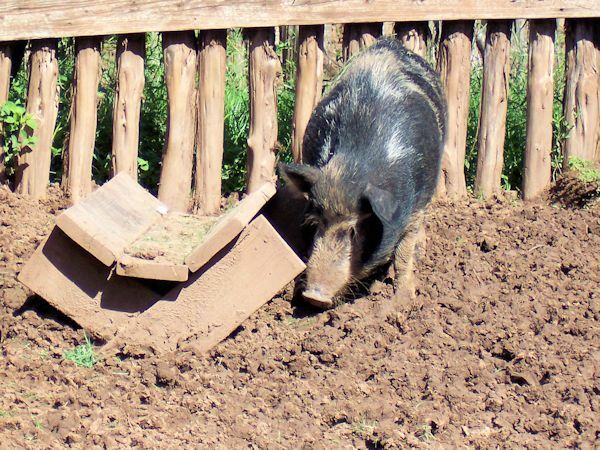 The farm also has pigs. We saw two. The picture is deceiving; these must weigh at least 300 pounds. No wonder they seem to be eating all the time. When the farm was in operation the hogs usually roamed free, only being rounded up and put in pens shortly before slaughtering time. But I doubt this one has anything to fear. These two one room houses were the slave quarters on the farm. Remember, this was long before the Civil War. 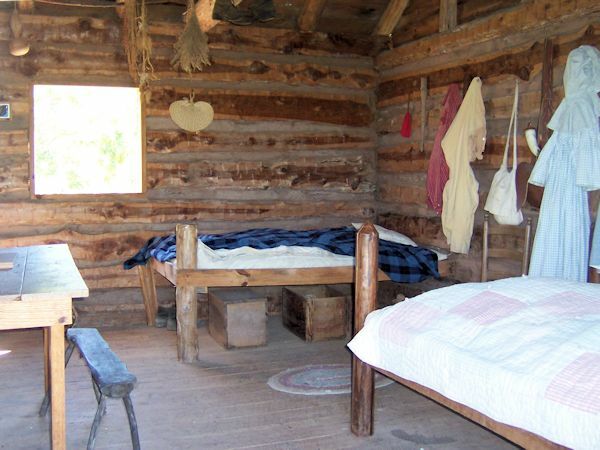 The Anson's owned 6 to 8 slaves and rented a few others during busy times. There may have been more houses. 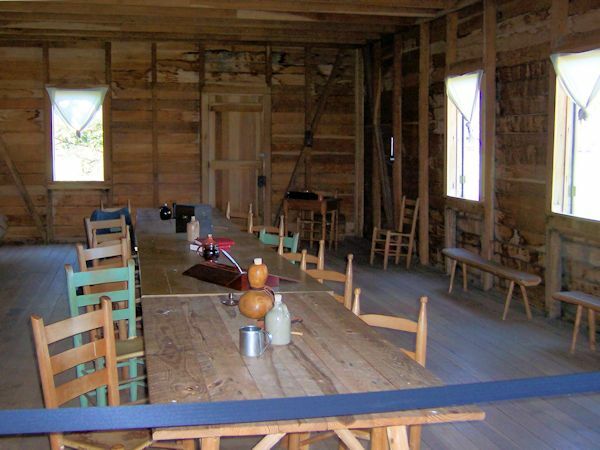 The interior of the slave houses was sparse. Just beds, a table and a fireplace to the left of the picture for cooking and heat in the cooler winter months. If these were the only houses they must have been very crowded. In sharp contrast is the Anson family home. It has two bedrooms, a dining room and living room on the first floor plus more sleeping room upstairs. The kitchen was in a separate small building close behind the house as was the custom in those days. The log building in the picture is the smokehouse for curing meat. 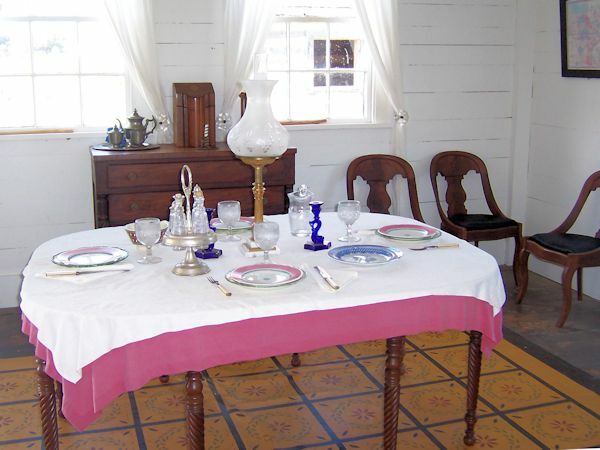 One of the better furnished rooms in the farm house was the Dining Room. It was a surprise that visitors could walk through all of the rooms. No roped off areas. An exception was the upstairs bedrooms, closed to the public mainly for safety reasons. The stairs were narrow and steep with no railings. Here's a closeup of the kitchen building, along with two laundry tubs. 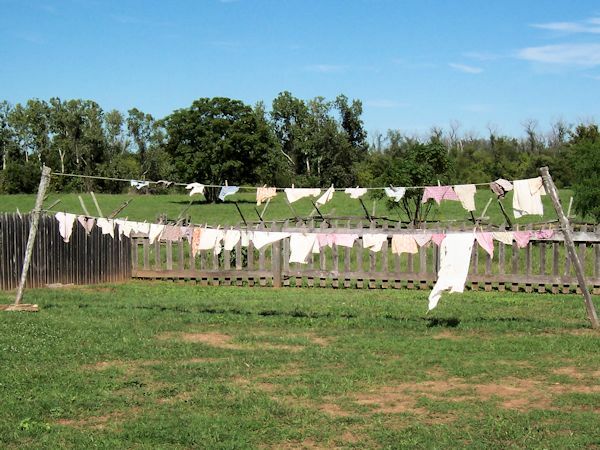 A school group was visiting and all of the children were given the chance to do laundry the old fashioned way. After washing the 'clothes' they were hung up on a clothesline to dry. The kids also played games and sang children's songs from the old time period. The interpreter at the farmhouse was really into her work. She said some of those who work at the farm almost consider it 'their' farm. 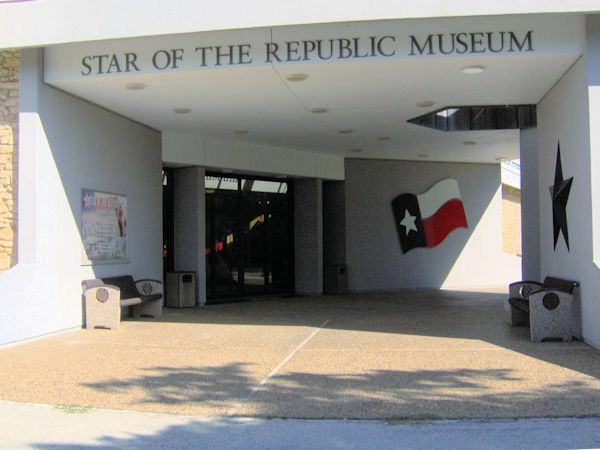 Our little journey into Texas History ended at the Star of the Republic Museum. 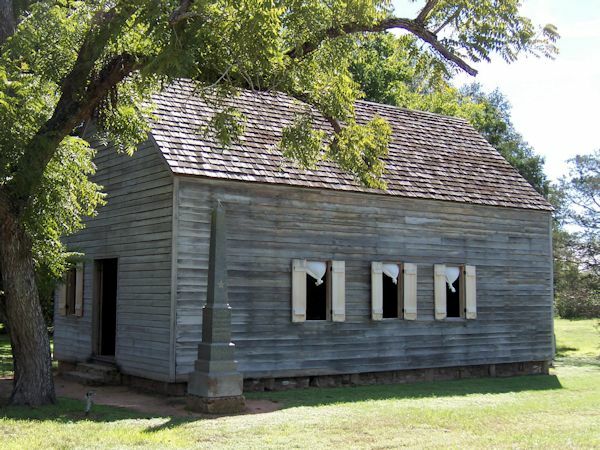 It has a fascinating collection of early Texas historical items. Unfortunately pictures inside don't turn out very well. 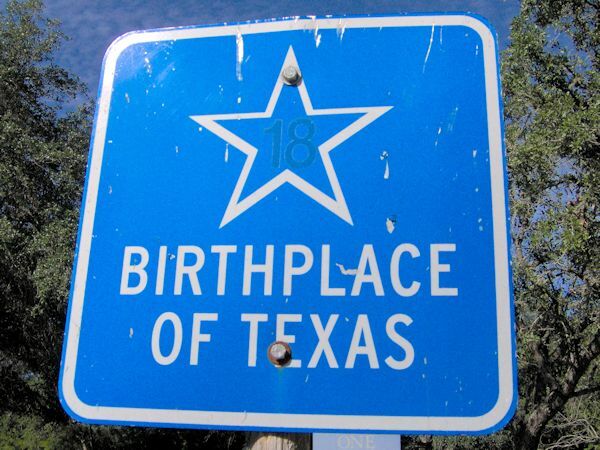 We did spend an hour or so here, learning things about the country and state of Texas. We left the park around 4:30. It was two hour drive to our campground near Bastrop and we definitely wanted to get there before dark. While having a trailer is a lot easier than tenting, it's still better to set up camp in daylight. As this story is getting long, I'll split it into two pages. 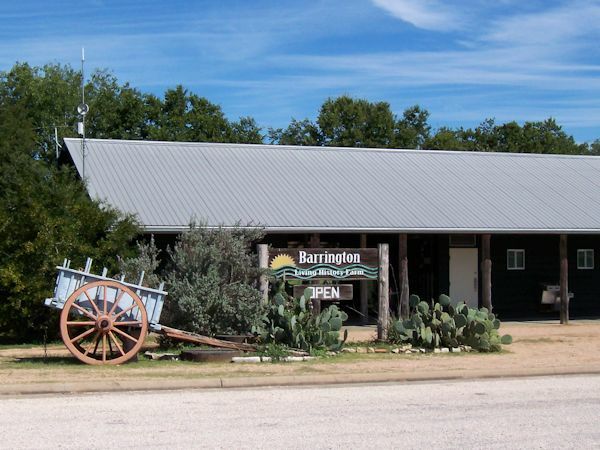 Just click the arrow below to go to part two, some history of Bastrop and Elgin plus some nature at McKinney Falls state park.